and then how nice it looks after it was repaired. A little steel wool and stain and it's almost good as new. Next I just needed to find the perfect place for it. It matches the wood and style in the living room, so I decided that is where it would find a new home. Since this is such a small room, I can't use a very big table, so this turns out to be the perfect size. This is what I've had there, not an end table at all, but a plant stand. It was the only small thing I had, so I made it work. This looks so much better and appropriate. There's also room for one of my southern ladies and a really tall cloche on the bottom shelf. 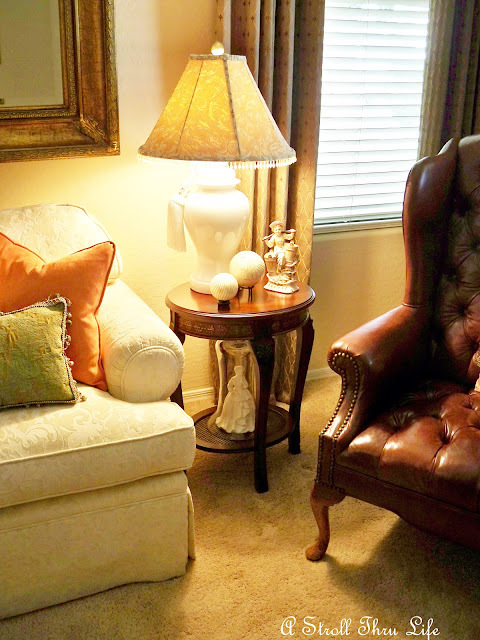 I switched the two table lamps around, this one was on the draped table on the other side of the sofa, however it is taller, so it is a better height for the shorter table. I'm thrilled with the look. I think it turned out perfect for this area and you just can't beat the price. So, what are you redoing and what treasures have you found lately? Amazing! it is perfect for your living room! And a place for a cloche, does not get any better than that. Glad you rescued it! The table is beautiful and perfect for that spot. What a great find! I need to come and shop at your goodwill! Great find, and great price! Great little table. It fits in well in your living room! Wow, Marty, you did a fabulous job. It looks like it was never damaged. What a deal and it is perfect in that spot. What a cute little table. It look great in that spot. I love the southern lady. Thanks for sharing. Beautiful, Marty! I love it in that cozy spot. 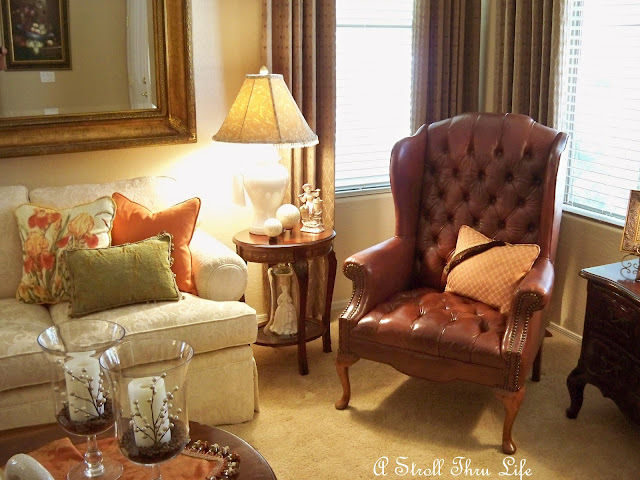 Since my living room is on the small side, I am always looking for smaller furniture. This is a great find! That looks perfect Marty. Gorgeous! 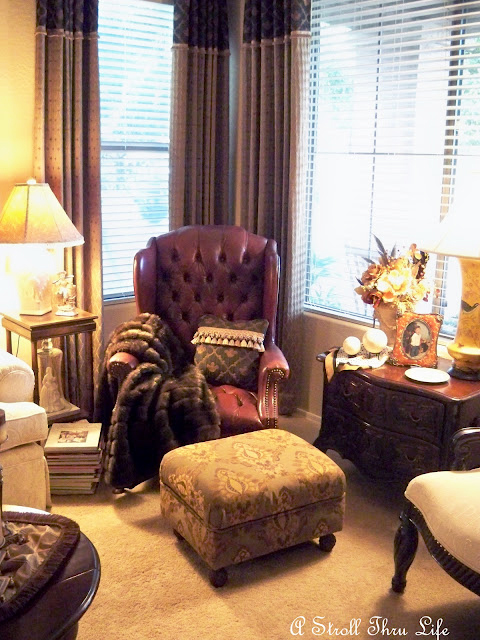 It IS perfect for that spot AND how wonderful that there is room for a cloche too? What a bargain. Oh it is pretty Marty and it is perfect there! You did a great job on it! Marty, it is beautiful! 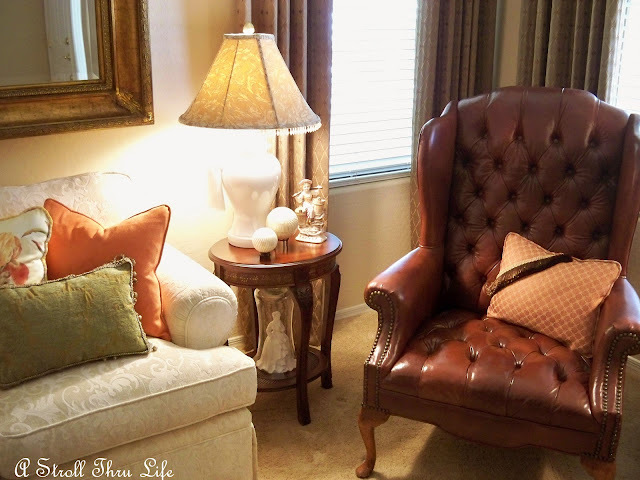 It looks so perfect in your living room! What a great find! Marty, I just love your style and the fact that you shop at GW for treasures. I too am an avid GW junkie and I have to say, that little table was just the icing on the cake! So perfect for that area in your living room! Oh Marty it's PERFECT! I do like the round shape MUCH better than the square!!! The round shape mirrors the curves of the chair AND the couch! LOVE IT!!! Marty, this little table was meant for your living room. Perfect spot! Love it! It goes pretty well in your living room! and that price?! unbelievable! Marty that is really beautiful. I can't get over the price. You did an awesome job fixing it. It was totally meant to be in your living room. It is the perfect scale and design for your room. Great job. It is perfect in that spot. Well done Marty. You cleaned it up nicely and it is just perfect where you have placed it. A great price too! I also love those little white berries in with your candles! 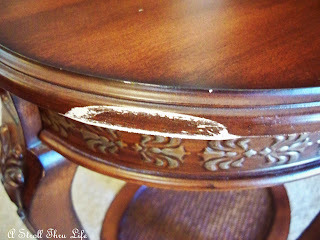 Love the details on this wonderful table! What a great deal also! Looks great in your living room! Marty what a beautiful find. Looks wonderful now that you used your TLC. What a fabulous find! We never have anything near so nice in our GW around here. You've done a fabulous job on it and it looks just perfect there! I love a great find! Perfect Marty! You found the perfect spot for it! That is just a lovely find. You did such a good job to restore it to it's former glory. Nice to see a lovely piece not painted white for once. Thanks for sharing. It fits right in now Marty! Looks like it was made for the space. Great find! Have a wonderful weekend. It looks great! The height is much better and the round shape is very attractive! You did a great job of fixing it up and I can't believe the bargain price you got it for! I just finished a bedroom I've been making over! What a GREAT table Marty and for $12.99! That is unbelievable! I would never have believed it was ever damaged at all if you had not posted the photo. Great repair and it looks perfect in your living room! Hi Marty - what a great find at Good Will. I haven't had as much luck at my GW here on Long Island. But, I think you have to go more often than I do! PS - hop over to my blog to see a beautiful ceiling design that I did. I will be putting this on some link parties today! It's perfect, Marty. What a great find. Marty, Your new round table is perfect there. What a find!! Our Goodwill is not a good one at all. I think, sometimes it must be the area they are in because folks do donate things...and to find nice things you usually need to find a good store. Great find! It looks perfect in you living room. I'd say you found the "perfect fit" for your living room! 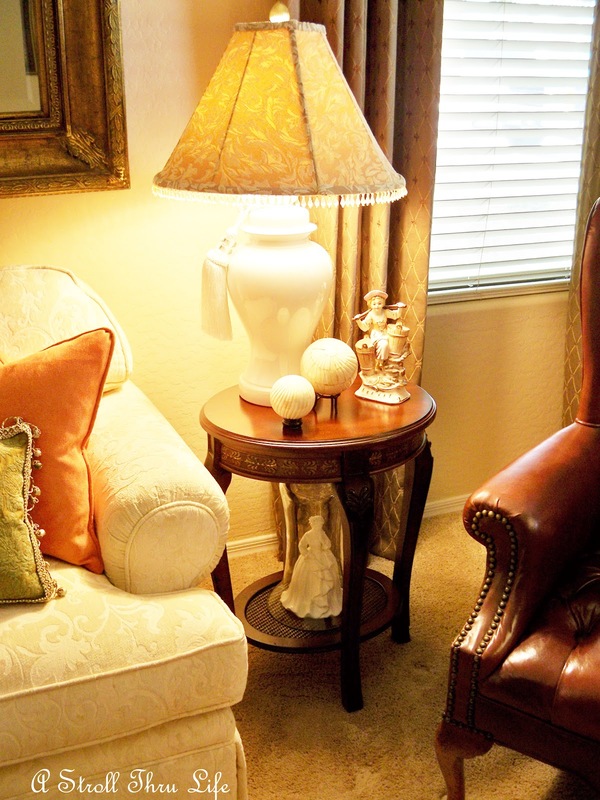 The round shape softens the area nicely!The lamp and cloche with the figurine mimic the same softness in the table! Simply elegant, dear friend! 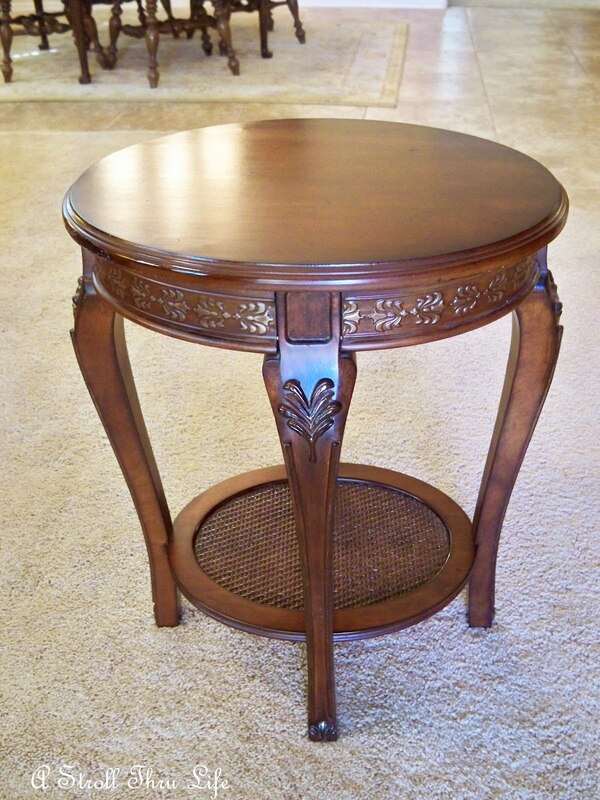 What a wonderful find in this little table and such a great price! It fits just perfect there by the chair. Thank you for sharing with us at TTF and have a terrific day! Hi, I'm back to let you know that I will be featuring this post in this week's TTF party! The post will be up today!